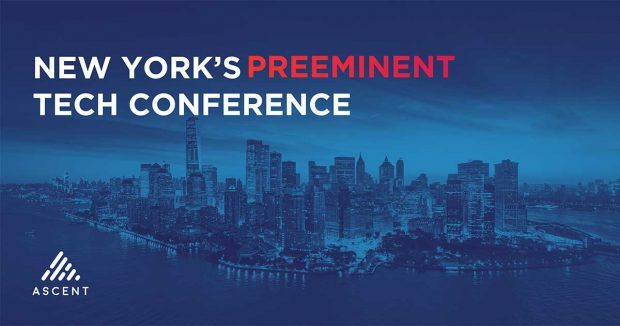 There’s a new tech conference in town, and its name is Ascent -- “The Only Tech Conference By Startups For Startups.” It took place on October 3rd and 4th here in NYC, and I was fortunate enough to be able to attend on the first day. I was curious to check this one out, as it promised to connect founders with investors, an area of connection that interests me very much. I was pleasantly surprised to learn that the conference was located at Pier 36 (the home of Basketball City), a 125,000 sq. ft. event space located on South Street just off the FDR Drive, with a parking lot (a rarity in this city) and fantastic views of the East River. For a conference making its native voyage, Ascent seemed to get off to a tremendous start. With approximately 2000 attendees, 200 exhibitors and 60 speakers, it offered founders the ability to get out in front of a whole lot of eyeballs and pitch new ideas, while providing a broad range of presentations and round tables on fundraising and business development. Investors had the opportunity to scan a huge array of offerings in nine different verticals, including Blockchain, Biotech/Healthtech, Consumer, eCommerce, IoT, AI/Machine Learning, Enterprise SaaS, Fintech and Foodtech/Agtech. I was impressed with the variety of companies exhibiting there, offering a really wide definition of the term, “tech,” ranging from Managed by Q, an office management support site that vets, coordinates and manages payment for facilities services and workplace staffing and also provides construction & renovation project management support, to True Gault, a women’s shoe company that uses a phone app to take pictures of your feet and then creates stylish, custom fabricated shoes for each foot. As small business owners, it may be inspiring to realize that there are so many options for incorporating technology into your business. One of the great things about tech conferences like Ascent is the ability to survey the marketplace firsthand, and actually engage with other business owners who may very well turn out to be future collaborators. 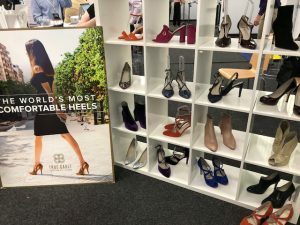 In fact, the theme of engagement and connection ran through many of the business models that were repped there. With previous deep experience on the Watson team, Galahad CEO Rob DiCesare combined artificial intelligence (AI) with machine learning and decision optimization technology to create an AI application that mimics human cognition and decision making abilities for everything from meal concierge services to personal fashion shopping assistance. Adrien Schmidt, Co-founder and CEO of Bouquet, offers an AI powered analytics assistant that helps anyone in your company to readily interact with and interpret your analytics data. And for the digital nomads among us, there’s GLYD (Go Live Your Dream), a travel and tourism app recently launched in Southeast Asia, that allows travelers to connect with locals in the cities they are visiting. As GLYD CTO Puneet Bhasin explained, the app not only offers a more authentic and unique travel experience for tourists, but provides valuable income potential for urban millennials in host countries, currently including the Philippines and India. The opportunities for creating truly valuable relationships at business conferences is quite profound, particularly when conference organizers make it easy to connect with exactly the right people. Using the Brella networking app, attendees were able to pre-schedule 15 minute meetings throughout the day with other attendees, based on shared interests and goals. In addition to meeting with Puneet, I spoke to several other interesting people over the course of the day, including David Zareh of KEC Ventures and Jacob Sock, CEO of Forward Thinking Technologies. David made the excellent point that in order to succeed in business today, you must have some form of tech incorporated into your infrastructure. However, we both agreed that in the end, the myriad of connective platforms we now have at our disposal only make you a good player if they are in service of developing good relationships. But it was Jacob, perhaps the youngest serial entrepreneur I met at the conference, who offered up some of the greatest inspiration of the day. The Detroit native, who started coding when he was in the 6th grade, started two LLC’s and spent six months as a CTO for a Silicon Valley start-up by the time he was 21. Forward Thinking Technologies, his current software development company is based on a culture of lifelong learning. With a blog, podcast and YouTube channel in the works, this young man embodies that culture in his enthusiasm and commitment to constant growth and a desire to bring his success back to his home city in order to help others achieve the same. Study the agenda in advance to plan out which sessions you will attend. Most conferences offer simultaneous programming both on main stages and in smaller, breakout sessions, so you’ll likely have to make some choices about which presentations are most critical to you. If you are attending with colleagues who have similar objectives, you might consider splitting up to attend different sessions and then sharing notes with one another afterwards. Take full advantage of any networking technology that is made available to you. More and more conference organizers are using apps like Brella to help people begin building significant relationships with fellow conference goers before the event even begins. Put yourself out there! Provide as much detail as you feel comfortable sharing in your bio to alert others as to your specific qualifications and interests, so you can foster the process of making more precise, genuine connections with the right people. Pace yourself. With hundreds or even thousands of people in attendance, big conferences can be overwhelming and super draining. Get plenty of rest beforehand, fuel up on coffee if necessary, and take breaks as needed. Remember, it’s quality, not quantity. Three informative, impactful sessions and three genuine, fruitful conversations with individuals whose goals are aligned with yours are worth way more than ten sessions and fifty conversations you barely remember. Follow up. Taking notes and making connections are both great, but they are just the beginning of a longer process. Once you’ve gathered all the raw data, it’s time to build on it and turn it into tangible steps forward. Take a few days to let everyone recover, and then send out those follow-up emails and get those new, inspired plans going. According to Ascent organizer Brendan Lowe, next year’s conference is looking to be about double the size of the first one. 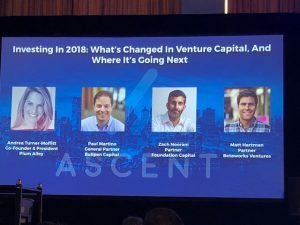 Business owners looking for new ways to incorporate tech into their operations and tech companies exploring the funding landscape or actively seeking investors should consider adding Ascent to next year’s conference schedule. For more information, visit https://www.ascentconf.com/.